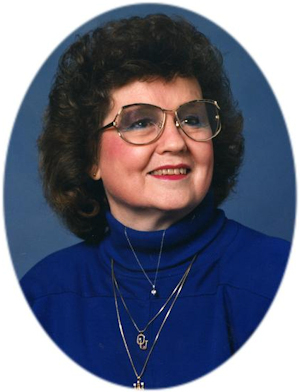 Obituary – Wilhelm, Rose Marie (Antle) « Perry High School Alumni Association, Inc.
Rose Marie Antle Wilhelm was born on her parents farm on June 22, 1930. She left this place to be with her Lord and Savior on January 31, 2011. She was baptized in the St. Rose of Lima Catholic Church in Perry, Oklahoma where she remained a lifelong faithful member. 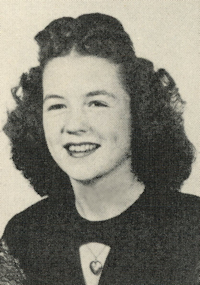 She graduated from Perry High School in 1948 and was very active in a local horse riding club. On April 3, 1949, she and Bennie Joe Wilhelm married and had four children Sid, Doug, Alicia, and Kim. Rose Marie would tell everyone that she wanted two boys and two girls having the boys the oldest and the girls the youngest, so the older brothers could watch and care for their sisters. She always praised and thanked the good Lord for her children. After working at JC Penneys for 20 plus years, she retired when the local Perry store was closed. She then worked for Dr. A.M. Brown until his retirement. At that time, she was employed as a hostess at the Cherokee Strip Restaurant until her retirement. She enjoyed and devoted her life to her family and her church. She also enjoyed reading, crossword puzzles, needlework, crocheting, and knitting. Although she was an only child, she was blessed with a large extended family of which she was close to. She was instrumental in planning and organizing many family reunions throughout the years. She held her family and extended family close to her heart. Rose Marie is survived by Sid and Janet Wilhelm, Doug Wilhelm, Kim and Mark Payne, all of Perry, OK and Alicia Wilhelm, of Enid, OK. Her grandchildren Travis Wilhelm, Russell Caldwell, Allison Payne, all of Perry Amanda and Chuck Flowers, and Jeff Payne, of Stillwater, OK, Ian Wilhelm, of Lewisville, TX, and her greatgrandchildren, Adisyn Rose Sheets, of Perry, OK, Hunter and Hannah Flowers, of Stillwater, OK, and Levi and Gavin Wilhelm, of Lewisville, TX. Rose Marie was predeceased by her husband of 51 years, her parents, William Green Antle and Delphine Almeda Neurburg Antle, her mother-in-law, Feba Wilhelm, and numerous aunts, uncles, and cousins. A Mass of Christian Burial will be held at 2:00 P.M. Thursday, February 3, 2011 at St. Rose of Lima Catholic Church. Interment will be in St. Rose of Lima Catholic Cemetery. Services are under the direction of Brown-Dugger Funeral Home in Perry. Memorials may be made to the Alzheimer’s Association in care of Brown-Dugger Funeral Home, 1010 N. 7th Street, Perry, Oklahoma 73077.